Stylish perfumes to wear on a daily basis. A new privileged sourcing of natural raw materials prompted us to develop a new scent collection: "Evocations de Lubin". These compositions are characterized by their simplicity. The heart of these eaux de parfum always combines 2 or 3 natural ingredients only, which makes them legible immediately. The precious ingredients which mingle together bring the sensation of outdoor scents, long lasting and fresh at the same time. Every perfume evokes a rare and precious moment in a particular place: aboard a sailboat which clears off on the Atlantic Ocean in the early hours, in a Tuscan garden in springtime or at twilight in the scrubland of the Peloponnese. 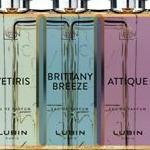 Elegant and sober, the eaux de parfum of the "Evocations de Lubin" collection address both men and women.